There is palpable fear in Lapai, Niger State, after scores of gunmen invaded the community, robbed two financial institutions – First Bank of Nigeria Plc, and United Bank for Africa. In the operation, which lasted for about an hour, the assailants were said to have killed a policeman and a security guard manning the banks, as well as a mechanic, identified simply as Aliyu. The incident happened around 5pm on Wednesday when the officials were rounding off for the day. A resident of the community, Mohammed Idris, in a phone interview with Punch on Thursday said the robbers came in a large number and announced their presence with continuous gunshots. Idris said the bandits parked their cars at a junction and blocked all roads leading to the community. “Some of them mounted roadblocks, while others marched to the Lapai Police Division and laid siege to the division. Others were said to have stormed the banks. “They were many. They attacked the police station and blocked every road that led to Lapai. They killed a policeman and a security guard attached to one of the banks and shattered the glass doors of the banks. They made away with a lot of money. They also killed a mechanic at a motor park, and left many injured. The boy has been buried,” he added. Another resident, who gave his name only as Adamu, explained that the assailants packed stolen cash from the banks in two cars belonging to bank workers and zoomed off to where their vehicles were parked. He said they abandoned one of the two cars along Ibrahim Badamosi Babangida University, and left in the other one, as well as their vehicles. Adamu added that the ambience of the banks was still solemn as of Thursday morning. He said, “I was in town when I started to hear gunshots. It was after the robbery that I went to the scene. I learnt the attack started from the police station. The policemen ran away. Some of the robbers were at the station, while thwe robbery went on at the UBA and First Bank at the same time. All the roads – Suleja, Mina and Bida – that lead to Lapai were blocked. They shot repeatedly into the air. “A policeman was killed at the UBA and one was seriously injured. At First Bank, one of the security men was also injured. At a point, some youths started throwing stones at the robbers. One of them was shot dead by the robbers and two others were seriously injured. The deceased boy was from the Batafu area of Lapai. His name is Aliyu. “Two cars were taken away from the bank. The robbers left one of the cars along IBBU Road. “This attack is first of its kind in Lapai; I have never witnessed such attack before. People were ran for dear lives and there were no security personnel to call upon. It was very terrible. Our correspondents learnt that the guard later died from the gunshot injuries. The Assistant Inspector-General of Police in charge of Zone 7, Abuja, Salisu Fagge, described the incident as unfortunate. Fagge said he was sent by the Inspector-General of Police, Ibrahim Idris, to sympathise with the affected banks and assess the level of damage done by the hoodlums. The Niger State Commissioner of Police, Austin Agbonlahor, said no arrest had been made, noting that the command had yet to ascertain the amount that was stolen from the two banks. Agbonlahor said detectives had commenced investigations into the robbery, adding that they had recovered a Toyota Corolla with number plate, KRD 561 AJ, Lagos. Head, Media and External Communications, First Bank Plc., Mr. Babatunde Lasaki, said he had yet to be briefed on the incident. 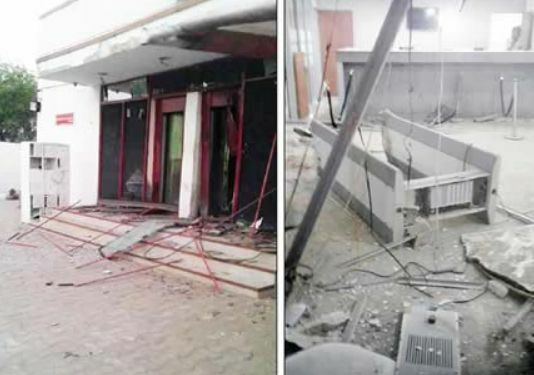 An official of the UBA, who spoke on condition of anonymity, confirmed the damage to the doors of the bank, but said the robbers did not gain access to cash. “I don’t think they were successful in carting away any money. They did not succeed,” he added. The police bosses were however silent on the number of deaths.